Today, we salute the most famous mouse of all, Mickey Mouse, and the transformative effect he has had on the world since his 1928 debut. The post-war boom years certainly saw some history being made across the world, and 1928 was a real corker. In the US, the Legislative Building, Washington State Capitol was completed, as was the Exhibition Hall for the Royal Horticultural Society in London’s Westminster. Jan Wils of the Netherlands won Olympic gold at Amsterdam; jazz musician and composer Edward “Duke” Ellington wrote Black and Tan Fantasy; Alexander Fleming discovered penicillin; and an unassuming cartoon rodent hit the cinemas, a rodent who would soon become more famous than sliced bread, which incidentally had also been invented that year. Yes, I’m talking about Mickey Mouse, who turns 90 this month. The story goes that Iwerks, pretty much the only loyal artist Disney had left after the Universal debacle, presented Disney with various drawings of dogs, cats, cows and horses, none of which won approval. But back in 1925, an artist called Hugh Harman (who was one of those responsible for setting up Warner Bros Studios) had drawn a picture of some mice around a photo of Disney and this is what inspired Iwerks to invent Mortimer Mouse, who later became Mickey. That’s what they say anyway, although it’s hard not to notice a close physical resemblance between Oswald and Mickey, and it’s quite possible that simply turning Oswald into a mouse and changing his name was the easiest way to stick with a winner and stay safe from potential litigation from Universal. Mickey acquired his trademark white gloves in 1929 in a short called The Opry House and has kept them ever since. Ub Iwerks, the man who actually drew Mickey, had long wanted his own studio, and when in 1930 he left Disney to set up shop for himself, everything changed. Disney had lost his closest associate and Mickey would now be drawn by other artists, credited of course to Walt. This was unknown to the buying public and did nothing to deflate Mickey’s burgeoning film career. Mostly appearing in short films, Mickey would occasionally pop up in feature length productions, notably Fantasia in 1940, causing a splash (literally!). Walt Disney himself originally provided Mickey’s voice and his first words were “Hot dogs! Hot dogs!” as a hot dog vendor in the 1929 short The Karnival Kid. Previously he’d only been heard to laugh and whistle. Eventually other voice actors took over the famous falsetto as Dear Old Walt became more and more inundated with running his rapidly growing studio. The first Mickey Mouse comic strip appeared in January 1930 and one of the stories was a loose adaption of Plane Crazy, which had failed two years earlier. Europe was also quick to jump on the comic bandwagon and featured Mickey in many publications, including Italy’s Topolino in 1932, France’s Le Journal de Mickey in 1934, Miky Maous in Greece, the Spanish Don Miki and in Egypt’s Sameer. Mickey Mouse soon conquered the world and the Disney Empire grew. Mickey’s 1942 cartoon Lend A Paw won an Academy Award that year, and Mickey went on to become the first cartoon character to have a star on the Hollywood Walk of Fame. The Mickey Mouse Club started on television in 1955 and continued for over 40 years. Innumerable amounts of merchandise, such as t-shirts, wrist watches, clocks, coffee mugs and board games featuring our favourite Mus musculus remain in constant production. The mouse had hit it big. 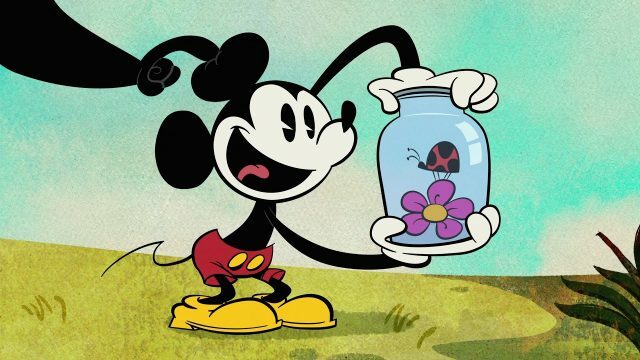 Over 130 films, countless comic strips, magazines, television shows and more recently, computer games, Mickey’s appearance has changed somewhat, and so has his character during his 90 years walking among us. Many of the early cartoons, seemingly innocent, actually reveal some rather unpleasant aspects of Mickey’s personality – racism, sexism and even depression and suicide. The trademark white gloves, for example, are something of a nod to the Minstrel shows that were popular at the time, and indeed any black person depicted in these cartoons was heavily based around the highly offensive black face, white eyes and mouth make-up worn by the Minstrels, which at the time was considered quite innocent and more or less de rigueur. Thankfully, times have changed. Another cartoon, The Barnyard Battle (1929), was banned by the German Board of Film Censors owing to the fact that Mickey in uniform was fighting a raging battle against enemy cats, who were all sporting German-style helmets. It was felt this was a negative portrayal of post-war Germany and would stir up anti-German sentiment around the world. In later years, Adolf Hitler was known to have included the line “Down with Mickey Mouse!” in his propaganda campaigns. Obviously not a fan. Adam Barnard has been a drummer/percussionist working with many bands around the Sydney scene for the last thirty-four years, playing jazz, blues, rock'n'roll, country and whatever else appeals to his imagination. He also repairs and restores drums, and he writes, sketches and makes films. He makes a pretty passable lasagne too. Will the new movie merch be virtual reality wearables?